“IT Is Too Important to Be Left to IT” So What Next? This is the most exciting time ever to be in IT!... But are we up to it? I’m not sure, but I think it was Brian Johnson who first coined the phrase “IT is too important to be left to IT.” However, I’d also add “…but the business isn’t grown up enough to be put in charge of IT”! 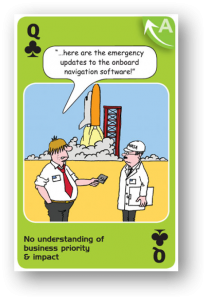 Herein lies one of the greatest, endemic issues we currently face in IT… Business and IT-alignment. Even the term itself causes heated debate. In this blog, I want to show some worrying facts and figures that underpin this issue. I’ll also touch upon Business Relationship Management (BRM) as a critical missing capability, exploring how BRM can help us take an important step in solving the “Business and IT-alignment” issue. Providing we do it properly of course. 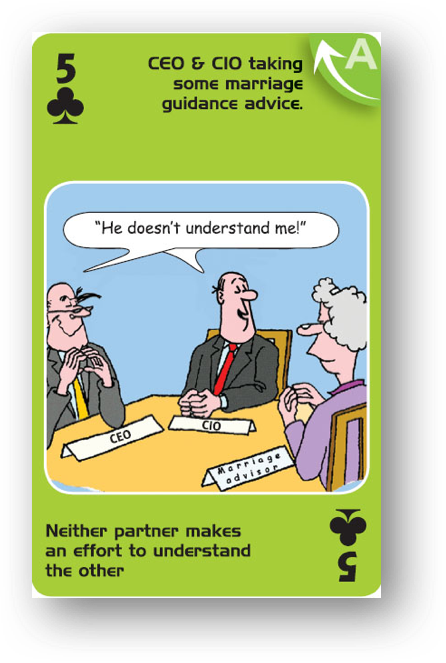 The ABC (attitude, behavior, culture) card below sums up the “Business and IT relationship.” This has been a top scoring card in global improvement workshops with more than 4000 organizations, and has been for the last 15 years. Why is it so exciting to be in IT right now? Digital transformation is the latest industry buzzword. Nobody knows what it really means, but everybody wants it. Suddenly all the vendor products and services in the market have “digital transformation” added as a byline in the description, and existing training catalogs describe how current courses support and enable this need for “digital transformation”… Phew, so we’ve solved that then! This means that IT and IT service management (ITSM) are becoming strategic assets and strategic capabilities. YOU are now a strategic asset. How cool is that to put on your CV? However, this new role brings with it great responsibilities and demands new skills and new ways of behaving. The question is will we take ownership for this new position we’ve been given? Will we develop the right skills and capabilities? Will we start behaving like strategic assets? Either we do, or we face the alternative “tragic” consequences as shown in the t-shirt above. What do you mean “but are we up to it”? The fact that “Business and IT-alignment” has been a top issue for the last 15 years clearly shows that current approaches to closing the gap aren’t working. A reason perhaps for the growing popularity of BRM? Not only are the current approaches not working, but we’re also not developing the right knowledge and skills. “We’ve learned and now we do continual service improvement (CSI)!” If only this were true. In a recent mini study my company undertook, less than 20% said they had formal CSI in place. Now I know I’m not the brightest crayon in the box, but all this clearly shows we need to develop more business understanding and more business-focused skills and capabilities. With “Business IQ” being one of the key competence areas within the BRM Institute body of knowledge. The business isn’t grown up enough to be put in charge of IT either! This is another top-three ABC card chosen in our global workshops. We cannot implement effective priority mechanisms without the business. It’s easy to blame IT. However, it isn’t all IT’s fault. There needs to be, from the business, better governance of enterprise IT. Says who? An ISACA study (Benchmarking and Business Value Assessment of COBIT 5) revealed “More business involvement in the governance of enterprise IT is required,” highlighting a low maturity score on benefits realization and risk optimization. Perhaps a reason why “70% of everything spent on IT doesn’t meet the functional goals of projects or deliver the expected return on investment” according to a 2015 NetworkWorld article. Correct me if I’m wrong, but isn’t digital transformation about realizing business benefits from emerging technologies? And, managing the inherent risks of doing it and of not doing it? Sounds like governance to me. So, we need some sort of executive-level commitment and governance if we want to realize the benefits of digital transformation. However, in a recent “hands-up” poll I did with event delegates representing more than 500 organizations, sadly only about 25% said they had “Formal IT governance” in place (such as COBIT). 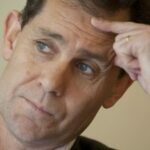 Perhaps there’s another role here for BRM to become the “trusted advisor” to business users? Why is governing IT so hard? In another article from CIOInsight.com entitled “Cultural issues derail digital transformations” it was revealed that 62% of CIOs said the biggest hurdle to digital transformation was “cultural issues.” So, it seems it isn’t just IT-facing “Attitude, Behavior and Culture” issues. However, the business doesn’t attend IT conferences or read IT blogs and often doesn’t know what it doesn’t know. Unconsciously incompetent (“the individual does not understand or know how to do something and does not necessarily recognize the defict” - Wikipedia.) The challenge here is “Who has to point this out to the business?” IT currently has an issue with trust and credibility and we now want to say to the business “Don’t worry – we’re now your strategic partner”! BRM from marriage counsellor to superhero in one tall leap! Is BRM the missing link to the endemic business and IT alignment problem? In a McKinsey report entitled “Partnering to shape the future – IT’s new imperative” it was revealed that 76% of executives found that IT should play a partner role to the business. Only 27% thought that IT already fulfilled that role. It would appear that BRM not only has to improve the relationship between business and IT but also enable them to transform and to solve something they haven’t been able to solve in the last 15 years. Oh, is that all?! So how do we do this? Send staff on a two-day BRM Professional training course to get the certificate? Now where have I seen that approach before? Let’s not make the same mistake we made with ITIL –focusing too much on the certificate rather than developing the competency, not to mention the fact that the business partner won’t be attending the training. So how do we engage the business in this capability-development initiative? We already do BRM, we don’t need BRM training! The majority of organizations who engage us to run business simulations as part of an education or organizational improvement initiative recognize these business and IT issues. When I suggest we focus on BRM in a simulation an answer is often “No, we already do BRM!” More often than not they either have some kind of account management function or a BRM role that serves as a tactical or operational fire-fighter, solving issues that ITSM should have solved. However, all too often BRM roles have no “authority” and are not seen as an added-value partner to both the business and to the IT provider organization. How do we solve this then? Excellent question. That is the topic of my presentation at the upcoming itSMF UK annual conference this November. In my presentation, I’ll be exploring the topic and presenting a case study on how one organization tackled this issue. Engaging with both the business and IT to gain commitment for strategic BRM, and BOTH parties committing to change behavior. And, if you want one tip to take away now. Make Monday “Go and meet a user day.” Do this regularly, ideally every Monday. Send everybody from IT into the business for one day to observe how IT services are used. To understand how IT services add value, the impact when services are down, and the priority moments – the critical business cycles. Have people come back and present their findings or invite a line-of-business IT user to come present at IT team meetings. 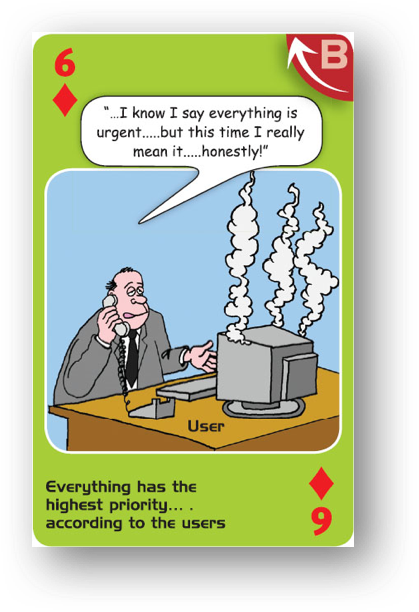 Remember: The top scoring ABC card for 15 years in a row is “IT has no understanding of business impact and priority”! 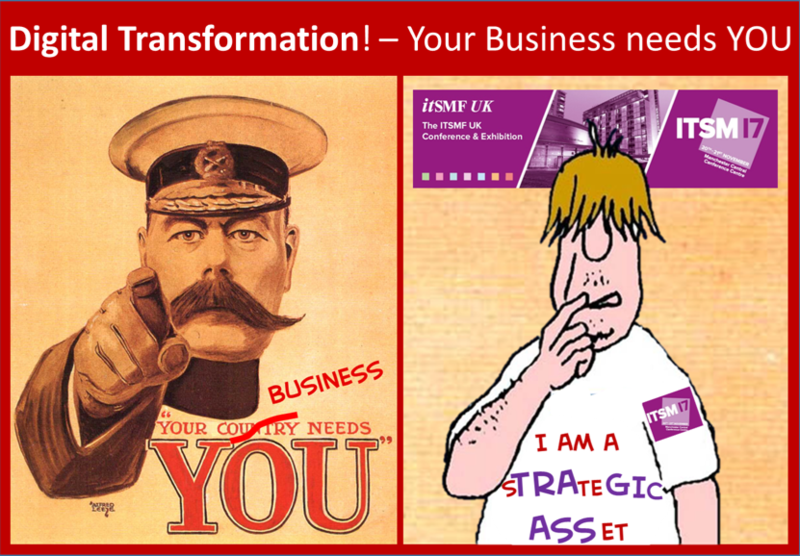 So, are YOU a strategic asset or a tragic…? Paul Wilkinson has been involved in the IT industry for more than 25 years and has a broad background in IT operations, IT management, and product innovation and development. He was project team lead in the original BITE (Business & IT Excellence) process modeling of ITIL, an ITIL V2 author, and member of the ITIL V3 advisory group. He is co-owner of GamingWorks and co-developer of a range of business simulations focusing on IT service management, project management, business process management, business and IT alignment, alliance management and co-author and developer of the ABC of ICT products and publications.